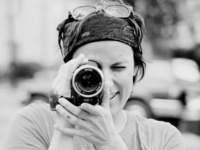 Katherine Brooks is an award-winning filmmaker, best known for directing three seasons of “The Osbournes” and MTV’s infamous “The Real World”. No wonder she has 4,987 friends on Facebook. However, Katherine feels alone lately. And it has been 27 days since she had a hug, so she’s wondering whether technology is hurting, or helping us. ﻿﻿﻿Are we really friends? Do you really know me? Can I trust you? Are machines taking over? Are we losing our ability to connect with each other? Do other people feel alone in the world like me? Armed with all these questions, the filmmaker has decided to travel across 50 states next summer and personally visit 50 random strangers that are her Facebook friends. Of course, Katherine’s making a feature length documentary out of her road trip… if she finds $50,000 to fund her travels and equipment, that is. You can help her out by backing the Face2Face project on Kickstarter here. This is definitely not the first “Facebook road movie”. Have a look at Graham Smith’s “The Facebook Road Trip” and the fake documentary “Catfish“, if you’re interested. But seeing the reality television experience of the filmmaker, this could well become great documentary about the virtual friendships that are the foundation of Facebook. Posted by Pieter on April 12, 2011 at 4:21 PM. Use this trackback if you're linking this story.